The Still House Sessions will thrill whiskey and music lovers alike with a series of monthly shows in one of Tennessee’s premiere distilleries, the Leiper's Fork Distillery. "Runnin' with Ol' Waylon" - Music and Memories of Waylon Jennings, is a concert experience that chronicles one of the most powerful movements in Country Music history. In the mid-70’s, Waylon Jennings and his band The Waylors were a pivotal force that knocked Nashville and country music back on its heels. By Waylon standing up for the right to create music in his own way, a movement was born called Outlaw Music. This new sound and approach propelled him and other artists like Willie Nelson, and Jessi Colter to a level traditionally known to only rock and pop artists. Runnin’ With Ol’ Waylon gives the audience a unique opportunity to experience the fascinating personal stories, never before seen video and images as well as great performances of Waylon’s music, all from the band who lived it, Waymore's Outlaws. 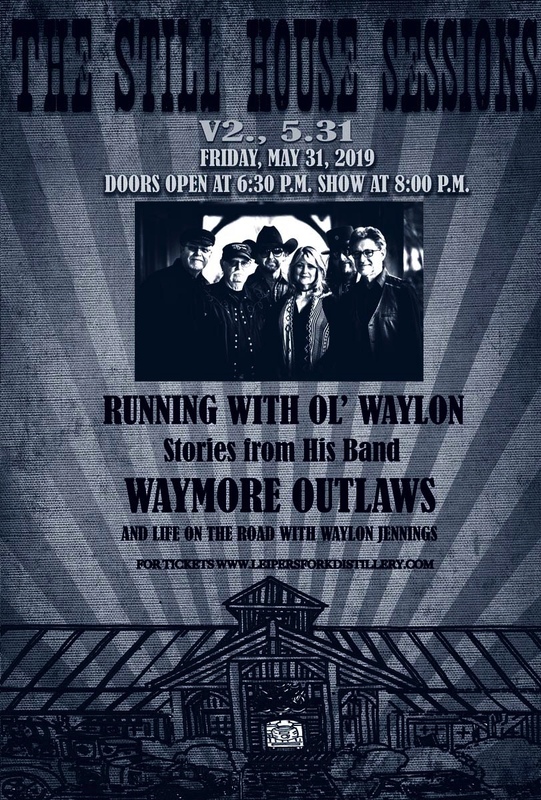 Waymore's Outlaws is a reunion of five former members of Waylon Jennings recording and touring bands, The Waylors and Waymore's Blues Band. This band features Waylon’s original drummer, longtime friend and right hand man, the legendary Richie Albright, Alabama Music Hall of Fame Award winning bassman Jerry “Jigger” Bridges, the only female member of Waylon’s band during the Outlaw era, artist and vocalist Carter Robertson, Grammy award winning producer Barny Robertsonon keyboards, ACM award winning Nashville veteran Fred Newell on steel and guitar. Covering Waylon's vocals and guitar is Tommy Townsend who, early in his career, was mentored by Waylon. Collectively, the band has performed on the recordings of Waylon's mega hits such as "I Ain't Living Long Like This," 'Theme Song from the Dukes of Hazzard (Good Ol' Boys)," "Luckenbach Texas" and "Rainy Day Woman," as well as countless other gold and platinum hits. Tickets can be purchased as: ONLY ONE: Waylon's Very Special "Outlaw Table" seating 6 individuals, VIP, and Reserved . VIPs will enjoy a pre-show whiskey tasting, a meet and greet and photo op, up front reserved seats, table service, an autographed show poster, and more. VIP tickets are extremely limited to 24 tickets and are $65. Reserved seating is $55, is limited and guarantees you premium seating. We do not currently allow you to select your seat. You will be seated upon arrival by hostess. Check-in at the front door of the Still House. This table will be $750 for the whole table with 6 guest total.